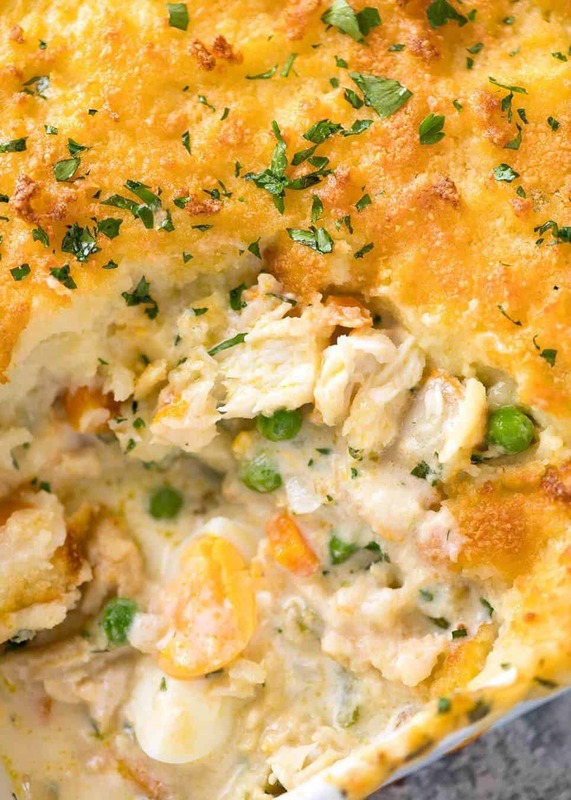 A Fish Pie fit for a king! Flakes of fish smothered in a creamy white sauce, topped with mashed potato then baked until golden brown. 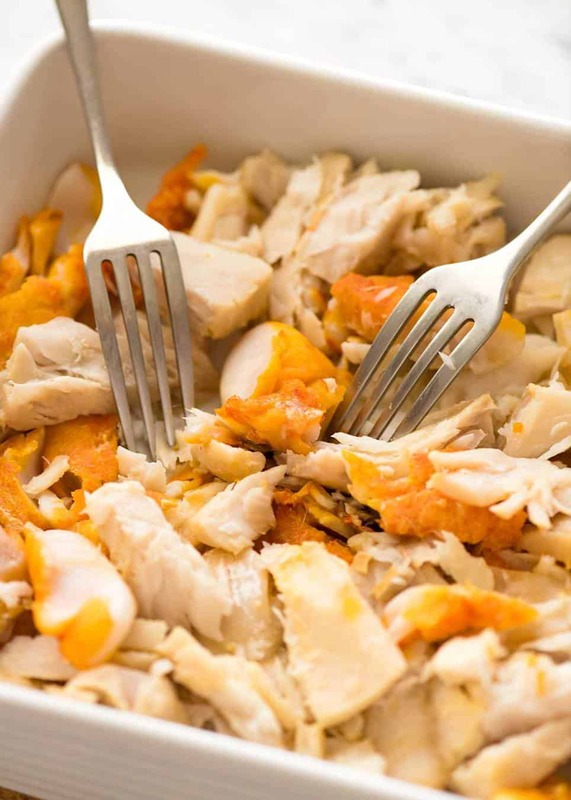 Use a combination of smoked fish and unsmoked fish for optimum flavour and texture, plus it’s more economical. 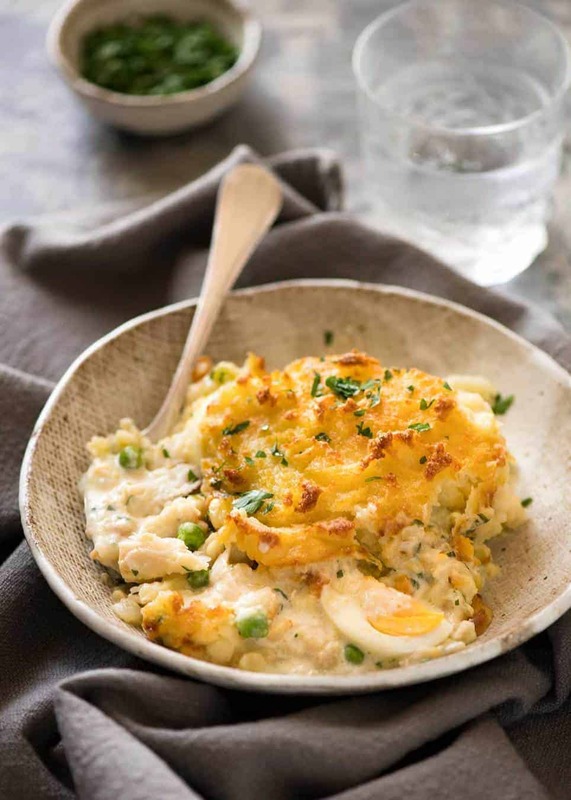 A hint of fresh tarragon really takes this Fish Pie to the next level to make it something a bit special! This recipe has a few more steps in it than my usual quick ‘n easy dinner recipes. But no more steps than usual pies – Cottage Pie, Beef and Mushroom Pie, Shepherds Pie. 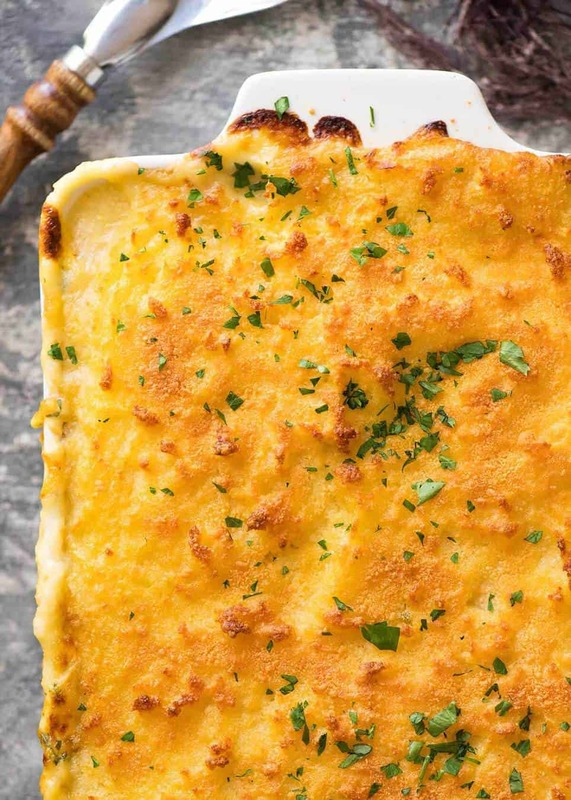 A golden crusted, creamy mashed potato topping. A filling loaded with flakes of fish smothered in a beautiful creamy white sauce. The extra pots and pans are totally worth it! 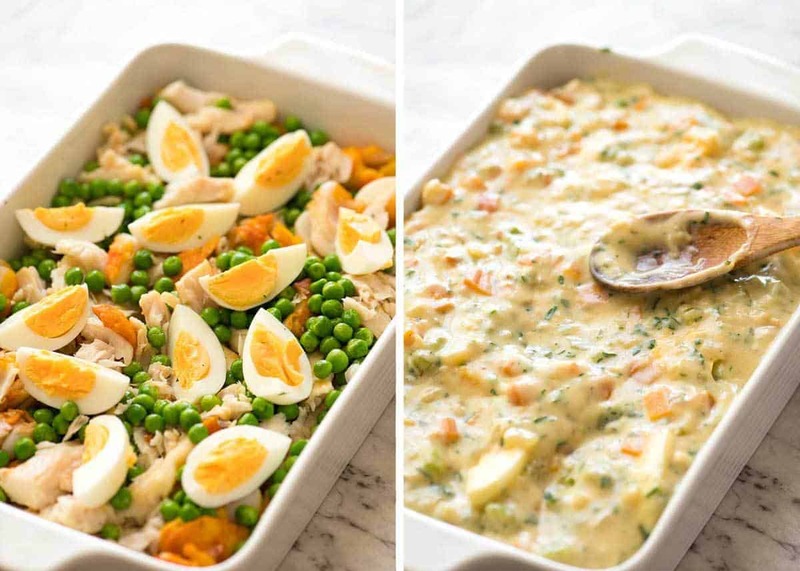 The key element of Fish Pie is the broth used to make the creamy sauce. And the path to a great broth is using the right fish. I like to use a combination of both smoked and normal unsmoked fish. The smoked fish (the bright orange one) provides most of the flavour. But I find it a bit overwhelming to use only smoked fish which is why I use both smoked and unsmoked (normal raw) fish. Here in Australia, our range of smoked fish is sadly lacking. The only one sold at my local fish shop and supermarkets (Woolies) is smoked cod. 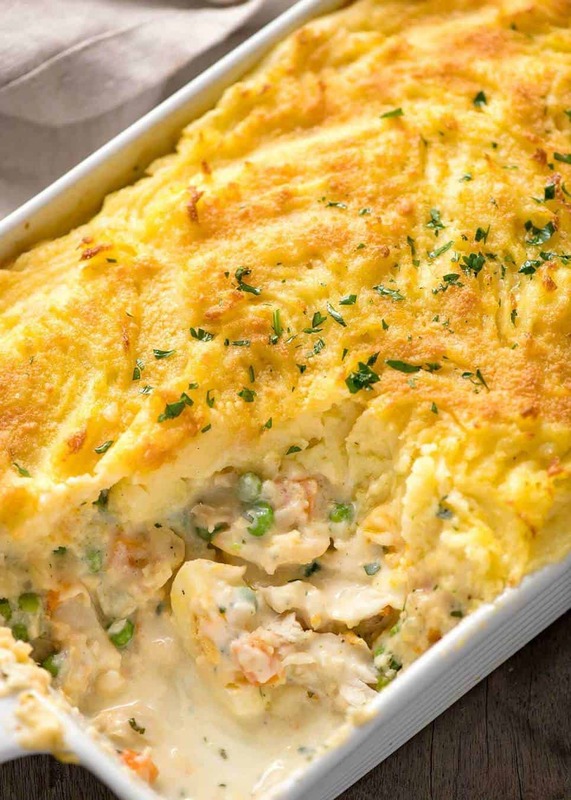 It’s great value – $10/kg ($5/lb), it’s well seasoned infused with good smokey flavour, so it’s fantastic for Fish Pie. And yes, it’s dyed. But I can’t deny that I love the colour it adds to the pie filling! Poaching the fish with onions studded with cloves is a traditional method that I enjoy using. 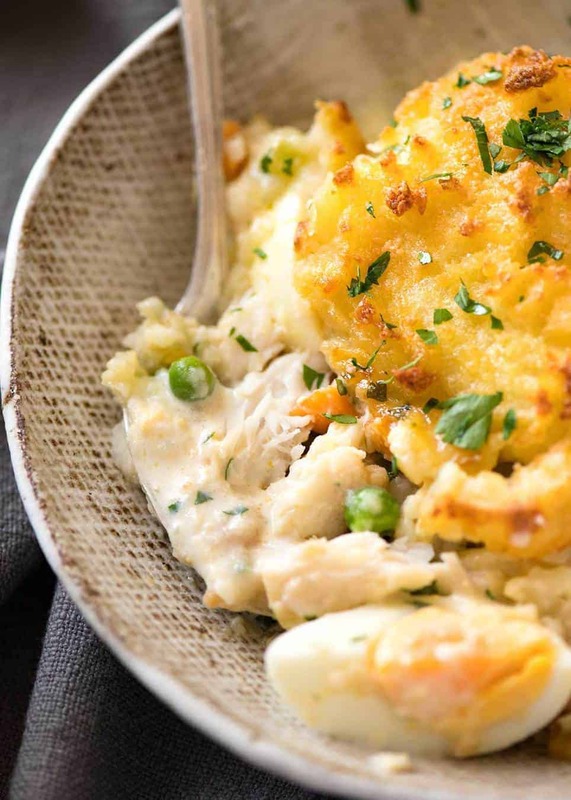 It adds a subtle hint of flavour into the broth to make this Fish Pie extra special. I think you’ll be amazed at the flavour that’s infused into the milk with just 7 minutes of poaching time. It’s flavour that can’t be bought!!! The flavour infused milk is then used to make the creamy sauce for the Fish Pie. I don’t think it’s strictly traditional to include sautéd carrots and celery in the sauce, but I like adding them because it adds even more flavour and it adds more texture to the filling. This is a point of disagreement between myself and my brother who believes the filling should be just fish, whereas I find the texture too one dimensional for my taste. So I’ve included the carrots and celery as optional in the recipe – otherwise I’ll never hear the end of it! (Much like the fact that I tinkered with his famous Sausage Rolls recipe. He keeps going on and on and on about it 🤯). Key tip for the sauce – make sure it’s pretty thick. Like honey thick – that’s the best way I can describe it. It won’t thicken any more in the oven and also it’s likely that the fish will seep some liquid while baking. So basically, make the sauce as thick as you want it to be when you cut into the pie. I’ve added egg into my Fish Pie, keeping with what I believe to be old school tradition. 😇 I have a memory of cutting into a Fish Pie in a pub in London, and was “fishing” around trying to find the egg. I wanted my egg! Give me my egg! 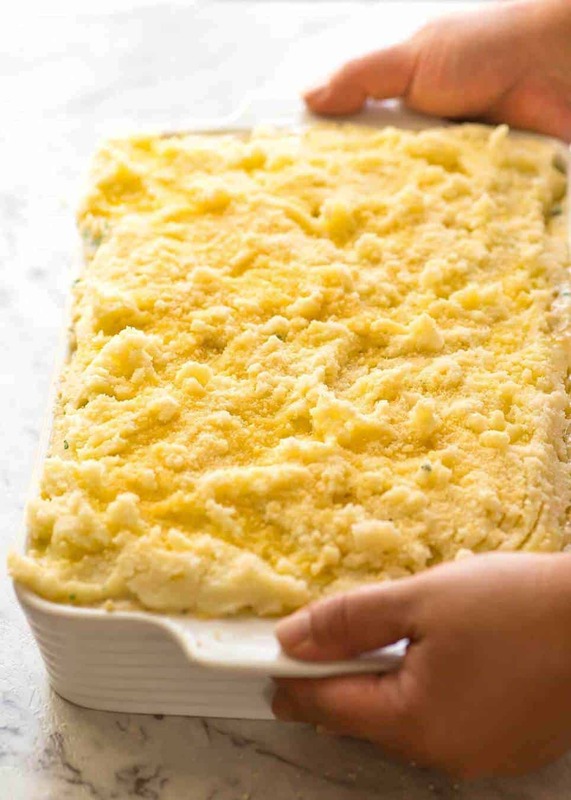 Top with mash, rough it up (more ridges = more crunch! ), drizzle with butter, sprinkle with parmesan and bake…..
……and look what comes out. I know I should be focussing on the filling, but let me have a moment. Look at that golden crunchy crust! It’s so good!!!! OK, now it’s the fillings’ turn. LOOK AT THAT CREAMY FILLING loaded with the tender flakes of fish!!!! PS Though if salmon is what you’re after, there’s plenty to browse. For gatherings, try this Baked Parmesan Crusted Salmon with Lemon Cream Sauce (firm personal favourite) or Salmon Gravlax. See all my Salmon recipes here! Honey Garlic Salmon and Lemon Honey Glazed Salmon – super quick! Recipe VIDEO above. 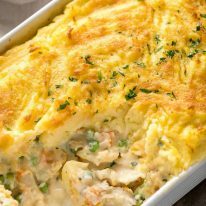 A grand Fish Pie, fit for a king yet economical to make! 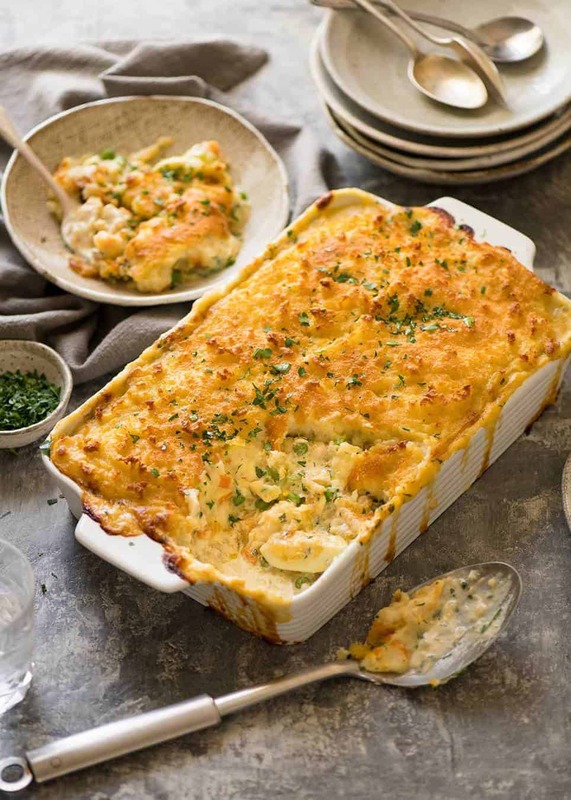 Chunks of fish flakes smothered in a creamy white sauce, topped with mashed potato then baked until golden. 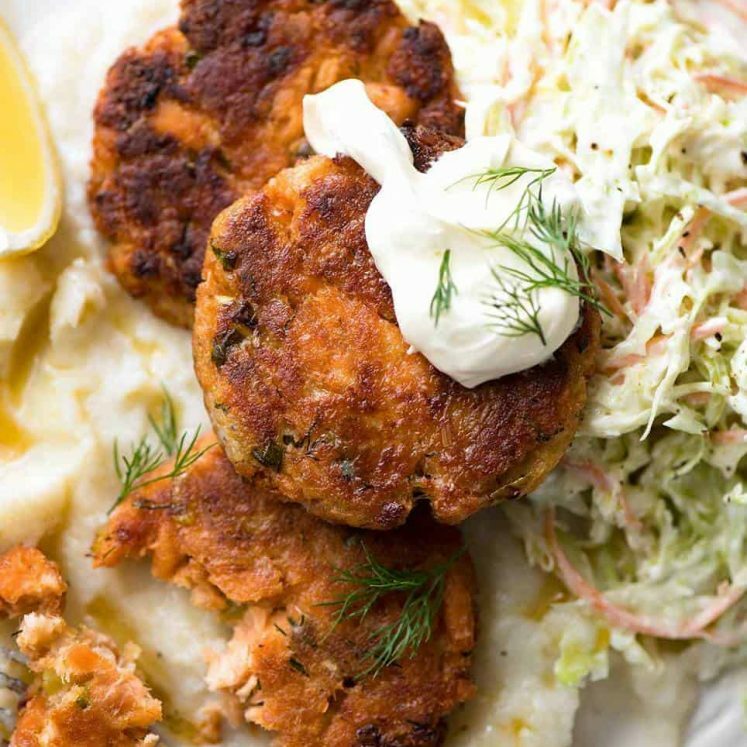 Use a combination of both smoked and raw unsmoked fish for optimum flavour and texture. Fresh tarragon is also optional - it gives an extra edge to the flavour that people can't quite put their finger on! Push a clove into the skin of each onion. 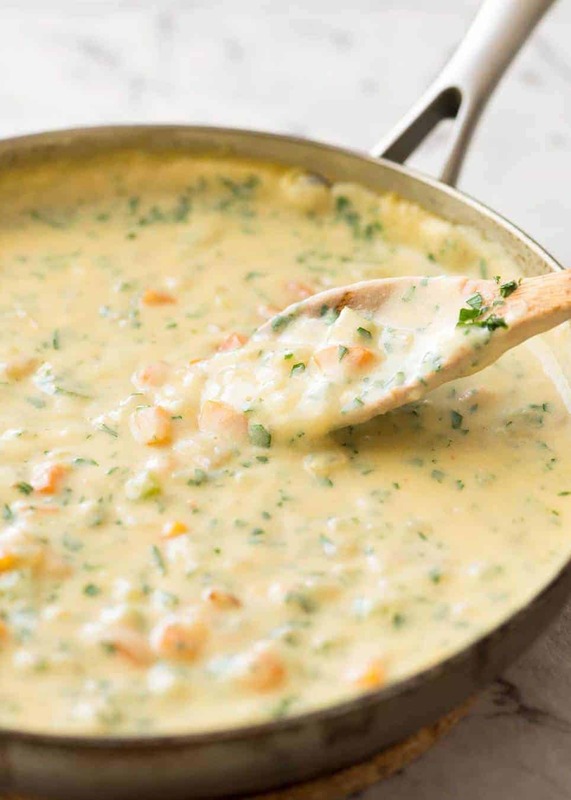 Place in a pot or large skillet, add milk, turn stove onto medium high heat. When milk is barely simmering, add fish - don't worry if it's not entirely covered, it can be turned / moved around. 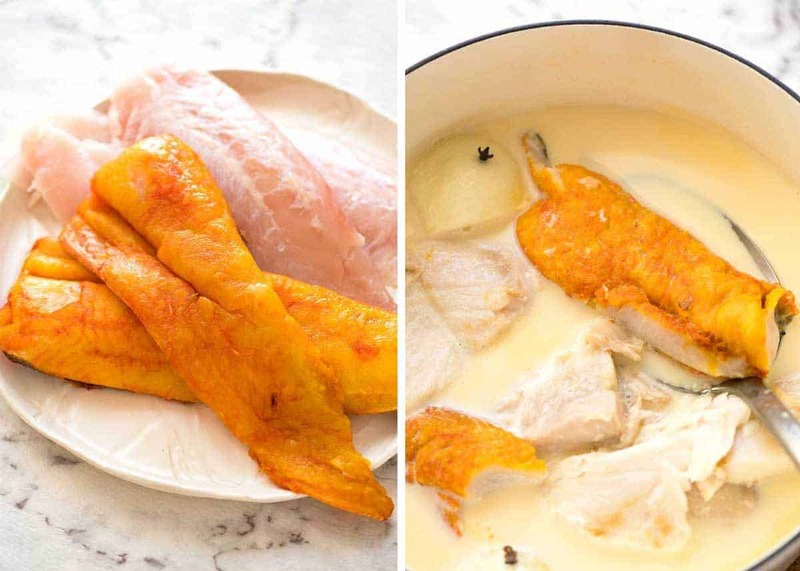 Poach fish for 7 minutes, then use a slotted spoon to transfer fish straight into a medium baking dish (Note 8). Flake into chunks using forks. Remove bones if you see any. Use slotted spoon to remove onion and cloves from milk, discard. RESERVE milk. Preheat oven to 180C/350F. Boil water for potatoes. Melt butter in a large, deep skillet or pot over medium high heat. Add onion and garlic, cook for 1 minute. Then add celery and carrot, cook for 5 minutes until carrot is soft. Turn heat down to medium low. Add flour, mix in - it will look gluey. Take it off the heat, stir through tarragon and parsley. Adjust salt and pepper to taste. Smooth top, then nestle egg in all over the pie. Bring a large pot of water to the boil. Add potatoes and cook for 15 minutes or until soft. (Do this while making the Sauce). Drain potato, add butter, milk, salt and pepper. Mash until creamy - add more milk if required. Immediately dollop then spread onto pie (cold mash = hard to spread). Use fork to draw squiggles on surface (rough surface = better golden bits). Drizzle surface with melted butter, sprinkle with parmesan. Bake for 35 minutes or until top is deep golden. Stand for 5 minutes before serving, garnished with parsley if desired. See notes for reheating and make ahead. * I didn't stir Sauce through the fish in the video, but I should have done. It disperses better. 1. I use smoked cod which is commonly found at fish shops and supermarkets in Australia and is good value ($10/kg at Woolies). Any smoked fish will be great - it really adds an element of extra flavour to the sauce and the dish as a whole. If you can't find smoked fish, what I would do is just use all normal fish (or prawns/shrimp! Use about 500g/1 lb small ones or chop large ones instead of smoked fish) and add 1/2 cup of grated parmesan into the sauce (stir it through at the end). That will add an extra flavour edge to the sauce to make up for not having smoked fish. 2. You can really use any kind of fish that can be flaked into large-fish chunks. Most common fish is suitable for this, including salmon, perch, tilapia, basa, barramundi, snapper, cod, monk fish, ocean trout. Tuna and swordfish are not suitable because they tend to go dry, and flounder is a bit too delicate and thin. But other than those fish, go nuts! 3. Just trim a bit of the onion end so when you quarter it, it holds together. 4. Studding the onion with cloves is optional, it's quite a traditional British way to make the poaching liquid. You can barely taste the cloves, it's more a subtle fragrance. 5. Use any floury potatoes suitable for mashing. I use the dirt brushed potatoes (Sebago), if you're in America, Russet is ideal. 6. Boiled egg is optional but again, is traditional. Bring a saucepan of water to a gentle simmer over medium heat. Gently lower eggs into the water using a slotted spoon. Cook at gentle simmer (adjust heat as required) for 7 minutes. Transfer eggs into a bowl of cold water. Leave to cool, then peel under running water. 7. The Sauce needs to be fairly thick as it won't thicken in the oven and what you don't want when you cut into the pie is runny sauce. 8. My dish is 30 x 19 x 6 cm / 12 x 8 x 2.5". Anything around this size will work, including an oven proof skillet around 28cm / 11" wide. 9. WORKFLOW: There's a few components to this pie! This is the workflow I use: Poach the fish first and while it's poaching, chop all the veggies and prep the other ingredients. Once the fish is flaked, boil the water for the potatoes and get started on the Sauce. Cook the potatoes while finishing the Sauce. Pour Sauce over pie, then set aside while mashing the potato. Top pie then bake! 10. MAKE AHEAD: If making the whole thing ahead, only let the Sauce thicken to the stage where it's like maple syrup rather than honey (honey is thicker than maple). Then assemble the pie but don't bake it. Cover with plenty of cling wrap and refrigerate. Then bake on the day of for around 45 minutes at 180C/350F or until surface is deep golden. Leftovers reheat pretty well, but I do find that the filling is not quite as saucy as I'd like but that's a problem inherent with all pies like this because typically, if the sauce of the filling is perfect thickness when made fresh, then it tends to thicken when left in the fridge. 11. GLUTEN FREE: Skip the flour. Mix 1/4 of the poaching milk with 1/4 cup of cornflour / cornstarch until lump free. Add remaining milk into pan then the cornflour mixture. Stir and as it heats, sauce will thicken, make it the same thickness per video (honey thickness). Proceed with recipe. 12. 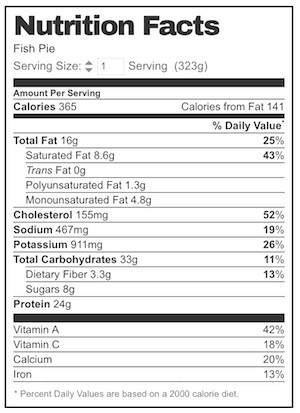 Nutrition per serving, assuming 8 servings. 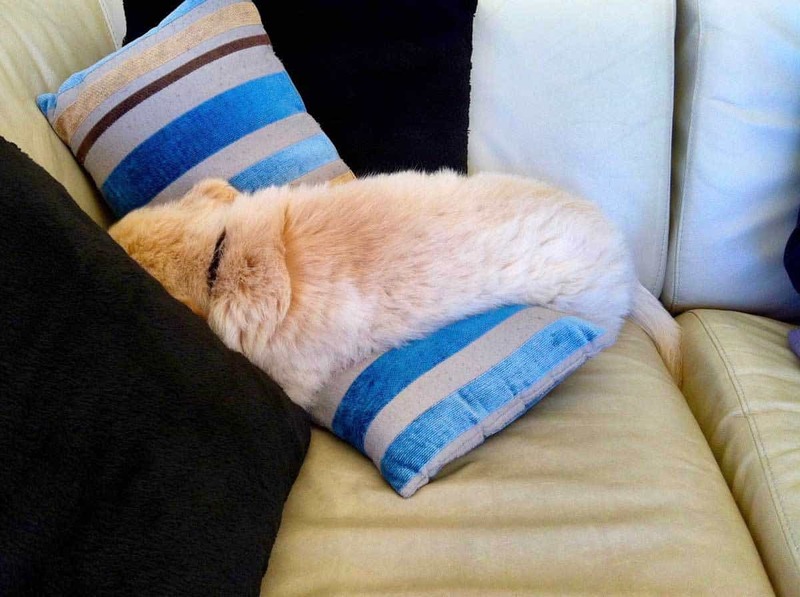 When I first got him, he was so shy he used to sleep with his head stuffed between cushions. Soooo cute…..! (Didn’t last long, he was ruling the house in no time). Made this terrific fish pie for Good Friday lunch, and it was super. Added heaped tsp English mustard powder to the sauce and did potato and cauliflower mash for the topping. Thanks for another great recipe. Fab ideas on your website. Sounds amazing Esther, I’ll have to give it a try! I am a reluctant fish cook but wanted to try this pie for Easter. Divided it into 2 pies so my elderly parents could enjoy it as well. Very tasty and easy to prepare, we will be having it again. I’m so happy you loved it Colleen! Thanks so much Carmel, I hope you love this one! 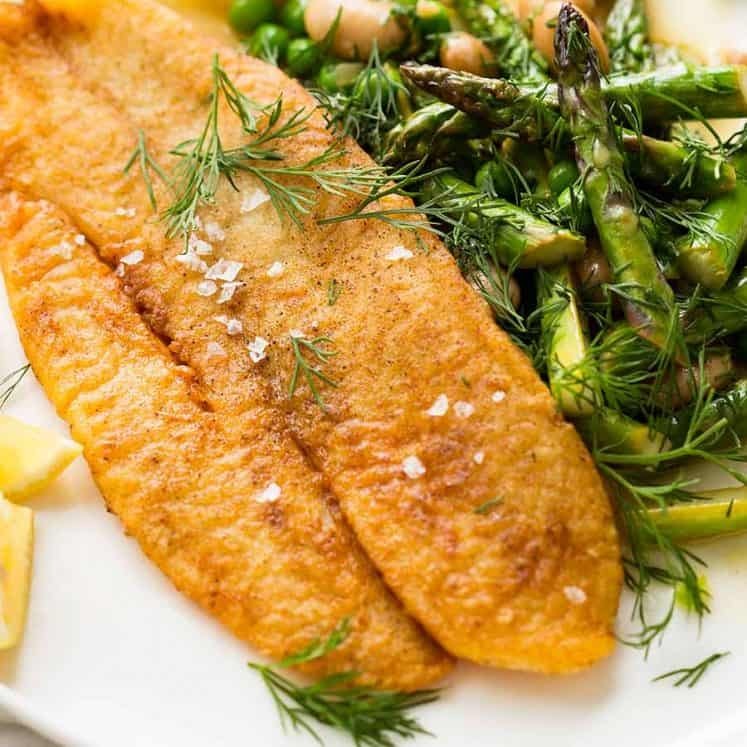 Hi Nagi, I laughed when I read about the smoked red fish, in Ireland years ago on a Friday this fish was always used, I mother used to make a simple white sauce to go with it, milk, corn flour, chopped up onion and a wee knob of butter delicious and simple! I use this recipe now. I must make this pie. Its a much better sauce with a teaspoon of Mustard and a good squeeze of Lemon. Sounds like a good idea, I’ll have to give it a go one day! I am in Australia and the fusion of flavours that are happening in the cooking world here at the moment are amazing!!! But I’ll do a full batch next time and freeze my lunch time adventures. First, I would like to say I’ve been perusing your recipes and have printed so many, I can’t wait to make them. I love your instruction and how you explain things. So many recipes leave out tips and important information (and I find you very funny too!). I love the varety your blog offers and am very excited to have found it. Second, I have a question…….I reside in the US…….Smoked fish in my locality is expensive so I would like to use fresh fish with the prawns, but to get the smokey flavor….do you think using a bit of liquid smoke would be plausible for this receipe? Just a thought for those who may not be able to afford or obtain smoked fish. 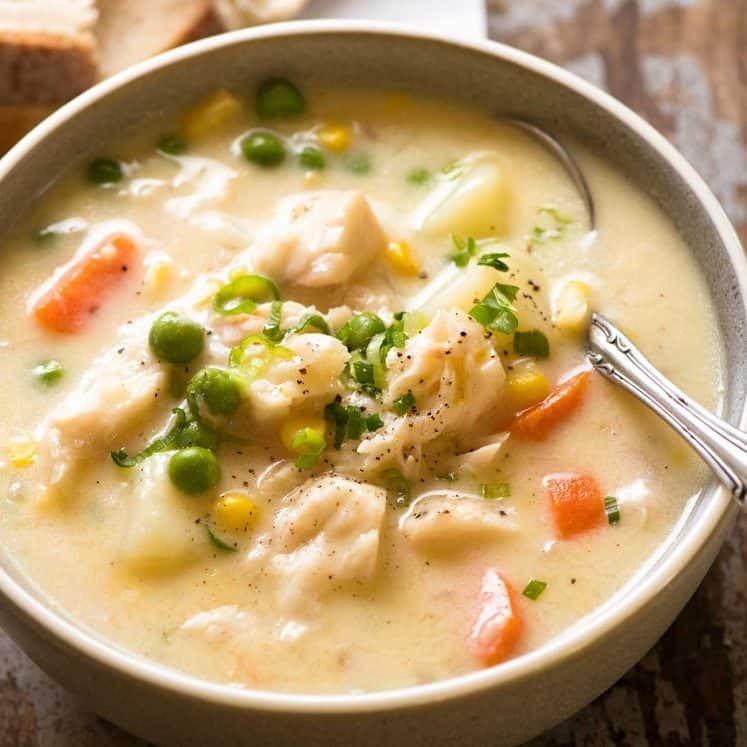 I made a seafood chowder a few weeks ago that was a huge hit and have been searching for something similar but with a twist….I found it in your receipe…thank you so much!